In a day when all books are being entered into a centralized database and then destroyed, Elliot’s grandfather leaves him a copy of Shakespeare’s complete works. When he shares it with the girl he has a crush on, tension enters the story. Looking on her in confusion, Elliott wanted to question her, to contradict what she was saying. He had to fight to keep his hands from reaching for the book. His eyes could not help but flick to it and Lara noticed. Sighing a little, she flipped to the close of the play and gestured to it, beginning to read silently for the point she searched for. And while Elliot relaxes in relief that the tension between them dissipates, Lara can’t forget. She compares several plays in the book with the database and finds significant differences. When she shares this with Elliot, the mystery and the problems spread. They find themselves in direct conflict with the security forces who support the data entry project as they dig into the clues that Elliot’s grandfather left in this book and in a poem called Day Moon. Setting his story in a not too distant future, Brett Armstrong updates the theme of social control explored in an early era by classics such a Fahrenheit 451 and 1984. In a world where cars drive themselves, Armstrong sees the potential–for good and for trouble–in the universal access to technology. With believable and interesting characters, the reader is drawn into a fast-paced jaunt across the modern city and then out into the wilds of the Appalachians. As Elliot tries to figure out who can be trusted, he faces betrayal several times but also learns that some relationships can be recovered. He also learns where he can find strength to confront an increasingly terrifying situation. While the events of the early part of the story follow the logic Armstrong sets up and carry the reader quickly along, a few incidents do not fit tightly in the story. Later, there are a few too many twists, slowing down the pace considerably. The reader may be tempted to skim through toward the conclusion. However, no reader will want to miss the details of the last two chapters as this part of the story comes to a climax and the steps for book two are set up. Some of the description is repetitive and a few moments feel like they are included only to illustrate a theme that has surfaced, the premise and the story are good. I give the book 3 and 3/4 stars. This review is offered for YA Bound Book Tours. I am an author, a farmer, a minister, and when I get a chance, a weaver. Storytelling that inspires is important to me. I have two novels set in ancient Greece, Moon of the Goddess and Before the New Moon Rises. 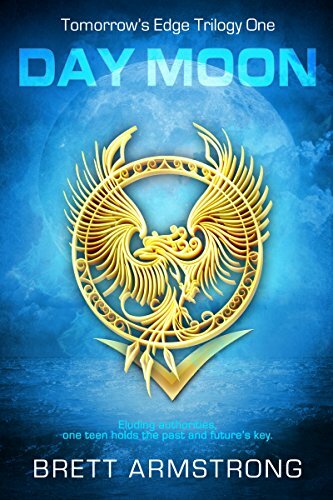 This entry was posted in Book Review, Day Moon and tagged Book Review, Brett Armstrong, Clean Words Publishing, Day Moon, Dystopia, YA Bound Book Tours, YA fantasy. Bookmark the permalink.